I started out with a pair of leather gloves, which I quickly stopped using. Squish a bee because you cant FEEL her under your glove and you will almost instantly have quite a lot of angry bees after you. When I got my own bees, I just got a veil. I didn't need anything else, or so I thought. In dealing with angry bees trying to protect the hives in the fall, I was constantly getting bees up under the veil, no matter how I tied it. I am to this day AMAZED at the ability they have of finding the ONE weak link in your protective gear. Once the bees get inside the veil, that veil is no longer a comfort or protection. So I sewed a long sleeve shirt to it, and that helped. A little. I got a call to collect a swarm from the crotch of a tree in a park.. OK, swarms are easy..
Several onlookers got stung, and I took 30 to 40 stings as I walked to the woods nearby. Never try to hive bearding bees. The second and third thing that happened, was I got two calls for cut outs. About a mile apart. Upon arrival, I hopped out of my truck, and got stung twice. I was waved around the back of the house by the owner, where we were somewhat safe. He showed me the dead cat the bees had killed... I suited up, and went around front. The bees were in the eave of the porch, and they were NOT very welcoming. They were all over my veil. I took more stings to the arms and even through my jeans. These bees were black. At first I did not think they were even honey bees, but they were the right shape. Despite stings, I managed to get the ladder up, and the aluminum eave pulled down. It was apparently a new hive, they had two little combs started, but they were also REALLY angry I had opened that eave.. I retreated, and put on a coat, with the long sleeved shirt over it. Long underwear under my jeans, taped my pant legs shut, put on leather gloves, and taped them shut to the long sleeved shirt... This time, as I approached... I was mobbed, seriously mobbed. So many bees on the veil I had difficulty seeing. That was the end of any attempt to hive this small colony. I retreated again, and waited for dark, and used two cans of wasp spray. Removed the comb, fixed the hole they had used and replaced the eave. The next morning, I went to the second location, and hopped out of my truck, and got stung... the bee was black... This colony was larger and had taken up residence in a carport beside the door to the house. By the time they were revealed I had completely had enough, and they died as well, right then and there. NOTHING I could do to them would have made them any meaner than they already were. It became apparent to me, that my sew job was not sufficient. I had seven bees in my veil, and received seven stings to the head and neck. So I began to look about for the BEST bee suit available. 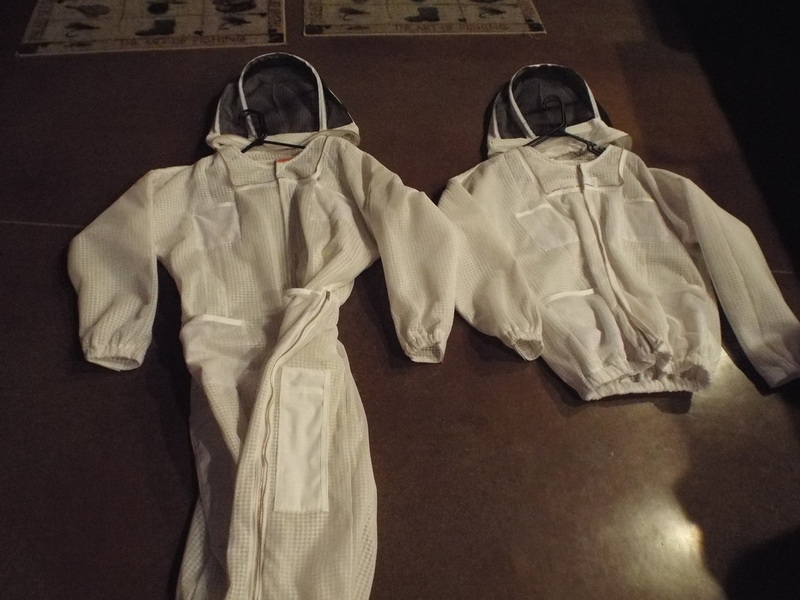 I looked at other beekeepers suits and veils, I read reviews, and I ordered Ultra Breeze Bee suits. A coat and veil, and a full suit. I have had these suits in some ugly places, and to date, I have NOT been stung through them. They are a bit heavy, but the mesh allows every breeze to pass through, and the mesh allows the heat from your body to escape unhindered. If it is 100 degrees out, you will not find a suit that allows ventilation and yet protects you as well. It is a strange feeling to wear one when there is a breeze. It feels like when you have a hole in your coat, or left your zipper down? I am beyond happy with the quality and durability.. The hoods unzip and can be flipped back, but are still easily accessible to flip forward and zip if trouble starts. I don't like to wear a veil, or gloves, so I usually don't, but having the coat on allows me to add protection if it is needed. I have done cut outs, and re queened NASTY hives with the coat and the full suit without getting stung. Wearing protection is a matter of personal choice. I forgo the protection, and it is usually not needed. In the event it ever is needed, I have complete confidence in the Ultra Breeze, and that is a good feeling. You will OFTEN see pictures on my site of me working my bees with NO protection.. I am NOT in any way trying to be macho. I have my suit nearby if needed. I will endure three stings. With the third sting, I put the suit on, and sometimes the gloves. Getting stung is not pleasant. Often I do not even feel the sting, but I DO feel the burn. If you feel the sting, or the burn, scrape the stinger out. Dont try to grab it with fingers, you will only inject the rest of the venom in the sack into your skin. Scrape it, with the hive tool, a knife, or even your finger nail. Removing the stinger and venom sack will greatly reduce the discomfort time. If done quickly the sting may not bother you at all. If you don't remove it until later, you will have discomfort in that area for three days. This is my personal experience. If you are more or less reactive to stings your experience may vary. At some point, you WILL want protective gear. Your bees may be very docile through spring and summer, but most bees become more defensive when the weather starts to turn and fall arrives. If they get robbed out in spring, or in summer, it is likely they can recover. If they get robbed out in the fall, they will perish during the winter. They become more protective in the fall, so be prepared. What ever you order for protective gear, you need to be comfortable and confident that it will do the job. Having that security will allow you to get the job done, even when the bees are bouncing off your veil by the dozen. Those rubber gloves doctors wear? Yeah, gives me nightmares too, but they work pretty well to deter bees. I do not know if they do not like the rubber, or if they think they are not ON a target, but the difference between wearing them and not is a difference of one sting in ten. Meaning, without the gloves you will take ten stings, with them you will take one. Your hands will sweat in them, but you can FEEL if you get a bee under your finger so you don't squish her. For a little better protection you can wear two pair, but there is also a little reduction in sensitivity with each layer. You will have to try them for yourself, and decide how you want to proceed. If your a tuff guy, you may think you don't need an expensive suit.. This tuff guy is sure glad he has one!! !